I first wrote this on December 10, 2007. I’ve long since sold many different XMs. I currently have a nice XM 7 string (has a trem) that is a fun guitar to play. I still have the same feelings as before. This could be a better guitar – even if we had to pay $149 for it or a little more. Some guitars have a dual purpose in their useful lives. The Dean Vendetta XM guitar is just such a wonder. Some folks need an inexpensive guitar to get them started – not everyone can afford a $2200 Les Paul Standard or a $1700 Fender Deluxe Stratocaster. Some folks need a decent instrument as a base (donor) for some seriously fun modifications – without having to spend $600 on aftermarket parts to put together a donor instrument for one’s ideas. Low-cost guitars tend to fall into one of three categories: cheap, and built to play that way; inexpensive, but not a hit in any area (GREAT specs but poor execution); and inexpensive – but more value than the dollars spent. The Dean Vendetta falls into the second category. As with all low-end/beginner guitars, there are obvious places in the Vendetta XM where money has been saved. Still, the build quality is not that great, but the features are actually wonderful. I specifically went out looking for a Stratocaster-shaped guitar for a mini-humbucker project I had in mind. I didn’t want an actual Strat (or Strat clone) this time: I was looking for double cutaway, light weight, and an interesting neck. The Dean Vendetta XM went on sale at my local Guitar Center – perfect timing. I had some proceeds from a guitar sale at Christmas time – and the Vendetta XM came home with me post-haste. It was the perfect donor guitar for the creation of an AWESOME double mini-humbucker project with a 5-way rotary selector. With some nice USA-made parts, high-end import parts, mods, and a little time, it turned out to be an absolute gas! Let’s talk about the factory Vendetta XM with which I started, pre-mods. Quick Opinion: The Dean Vendetta XM is a marginally good beginner’s guitar – one well-suited to folks who have not yet begun to grow into their inner guitar-hero-self – but who aren’t sensitive to a decent neck or sound yet. As with any beginner’s instrument, the Vendetta XM is not comparable to well-made instruments from the United States or Japan. If one doesn’t expect high-end guitar-ness in the Vendetta XM’s $100 form, one will be OK with the result. No, the Vendetta XM is not an American Standard Stratocaster. No, the Vendetta XM is not a USA-made Dean for the family heirloom closet. The Dean Vendetta XM is a nice-looking, OK-playing instrument for beginners. It is lightweight, well-featured, and actually looks different than most beginner guitars. I think the Dean Vendetta XM is a so-so guitar for starters – one that can be upgraded to accommodate the growing needs of a burgeoning guitar player. This guitar is particularly good for smaller folks (who still want a full-size guitar), or for those that don’t like lots of weight hanging on their guitar strap. My Dean Vendetta XM was not very well set up when I got it. There were (more than usual for a beginner’s instrument) fret buzzes and the strings were set too high for a beginner. The intonation is pretty close for a bargain guitar. However, nearly every inexpensive instrument I have ever played had some setup or adjustment issues when pulled out of its box. On the positive side – my Vendetta XM came with an arrow-straight neck and VERY unusually excellent soldering in the control cavity. If only the components in the control cavity were better-made. You can get free shipping on the Tremolo version of the Dean Vendetta XM here at zZounds.com. Please support my sponsor. Features: The Dean Vendetta XM’s features are very much it’s strongest point. The guitar has a string-through design across a Tune-O-Matic-style non-trem bridge – and the sustain and ring of the body definitely shine through. Even the acoustic sound of the Vendetta XM is pretty good. The string-through design makes for great “ring”, reasonable low-end frequencies, and an interesting look to boot. The simple control layout is a plus. One master tone, one master volume, and a three-way toggle switch adorn the Vendetta XM. The toggle selections are: neck humbucker, both humbuckers, and bridge humbucker. The toggle is a little close to the volume knobs (for quick-change switch slapping while playing). An inspection of the inside of the control cavity was surprising: the soldering was excellent, clean, and well-done. The anti-noise shielding black paint, however, was terribly applied (nothing a little copper shielding won’t fix) and the components were sub-par. The body is very lightweight and is a comfort to the shoulder. The guitar is a little neck-heavy because of the light body, but it isn’t obnoxious. My suede strap (fuzzy on the shoulder-side) held my Vendetta XM pretty well in place for long periods. One small sacrifice of the light body: the guitar doesn’t have quite as much sonic guts as a heavyweight like an Epiphone Les Paul, PRS SE, or Squier HH Stratocaster. Really, it doesn’t “ring” much at all. It absorbs sustained notes sometimes. The stock pickups and the light body do make for some relatively warm (but slightly mushy) sounds played through some amplifiers or models. This is an important thing: the guitar is Extremely comfortable; but there is a small price. A beginner would not feel the sonic difference early in her/his experience. But, this can be fixed with good pickups, a decent nut, and some good adjustment. Overall, the neck is well below par for an inexpensive instrument. 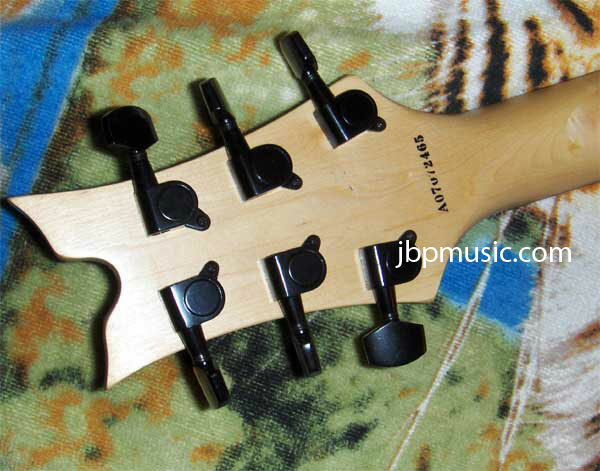 It is reminiscent of a nice Jackson or even a wider Epiphone neck in its design, but not its quality. I like the feel and playability of maple on the back once I got it smoothed and adjusted. The rosewood of the neck was kind of weird though: the factory had applied excessive “fingerboard black” to the rosewood. My fingers are black every time I played my Vendetta XM. My particular Vendetta has a great, straight neck. It does, however, have a rough feel – the finish had not been polished down/sanded well enough. The fret ends were pretty terrible. I had to work them just to get them from scraping my skin. 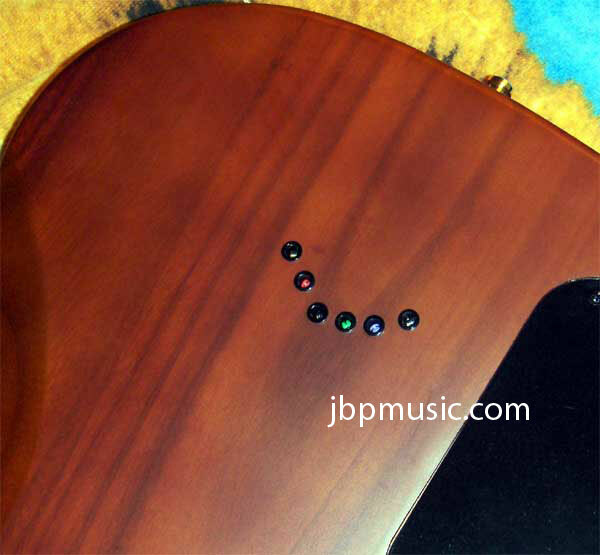 The tuners are adequate sealed machine heads that work fine. Strong bending does pull the instrument out of tune – but not any more or less than any other bargain guitar. The tuners are, however, smooth, better-than-average, and look a lot like the Schaller-type tuners on the nicer Squier instruments. 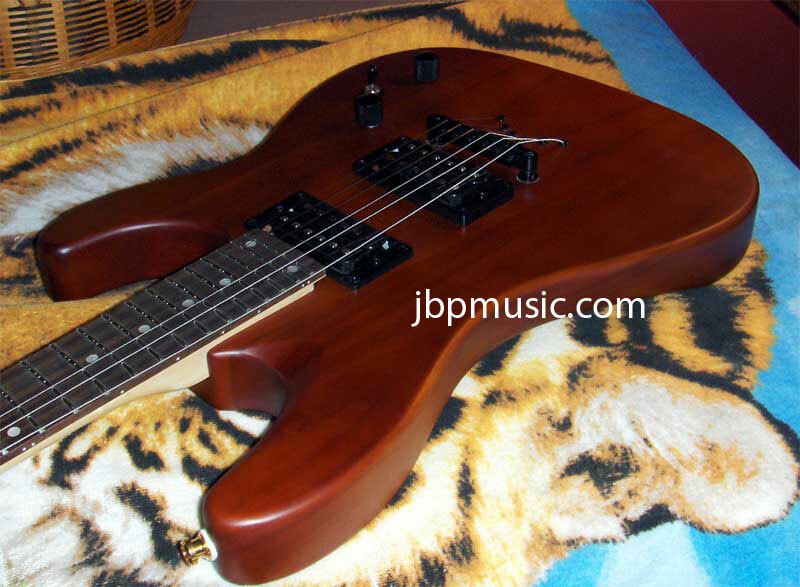 The dual humbuckers are average, and do the job well enough for a beginner instrument. As with any low-cost humbucker instrument, the humbuckers don’t sound like BurstBuckers, DiMarzios, or Seymour Duncan SH* pickups. They’re exceptionally easy to replace as the beginner becomes more desirous of better sound. Overall, the sound is decent and the quality is better than average. Like most pickups in guitars in this price range, they are a bit muddy and don’t articulate well. They’re best suited for power “chords” and note-to-note single tone playing. My Vendetta XM came fitted with nice lightweight D’Addario strings. They were in good condition, were well-selected for the neck and body type. It’s a refreshing change to see commercial-grade strings on a basic instrument – most instruments on the market have lowest-bidder strings installed at the factory. Quality: The quality of my Dean Vendetta XM is a mixed bag. The finish of the body is flawless – even, smooth, consistent, and attractive (no, they’re not gloss finished like in most pictures you’ll see – they’re satin finished). The finish on the neck is in need of a LOT of work. The neck finish was rough, the frets were unfinished, and the fretboard is just not as nice as it should be. Even the imprint of the serial number is poorly done. The neck finishing seems as if it was done in a big hurry. The nut is a hollow plastic variety – although this is not unusual in this price range, I’d expect more from Dean. Dean used to make such good stuff. The wiring and electronics are way below average for a $100 instrument. As with most instruments in this price range, the electronics will be noisy in a few years. Playability: The Dean Vendetta XM is a very playable instrument. It is comfortable from a strap and body-fit perspective, and the neck is a good balance for large hands or even some smaller hands. It is smooth and comfortable in almost every respect. The tuners go out of tune when the instrument is played aggressively. The instrument needs a reasonable set up when it is purchased – if nothing else to set the string height to the player’s liking. Value: The Dean Vendetta XM is an $89 value, usually sold for $119 to $99 street. Overall, it is a nice inexpensive guitar. On balance, though I really like Dean guitars, and I think they are the spice of the guitar store. I did not hesitate at all to purchase my Vendetta XM. I think Vendetta XM is OK for beginners, and mine has definitely made an excellent choice for my modifications! Wishes: Do a better job with the neck, Dean: please? The electronics can really use some help, too. Realistically, Dean USA guitars are keepers, no doubt. But their Asian counterparts leave a LOT to be desired. It breaks my heart (no sarcasm at all) to say this, but Deans have become the “80s Hyundai” of guitars. They devalue massively more than their competitors, and their reputation amongst the new generation of guitar players is all but dashed. The only ones that get any attention are the ones that Dimebag Darrell played… but even those don’t get ANY respect on the secondary market. Dean, where are you? I’d love to see you make your way back to high ground. Here’s an interesting test of a guitar’s value: Try to sell one of a given model on Craigslist. If you put a Dean XM on Craiglist, you get derisive emails. Interesting, isn’t it? This entry was posted in Electric Reviews, Guitar Review and tagged dean, electric, guitar, review, vendetta, xm by Jim of Vivid Peace. Bookmark the permalink. Which 100 dollar, 24 fret guitars have better electronics? If you are considering used, ESP/LTD 24-fret guitars tend to have the best pickups and harnesses in that price range.